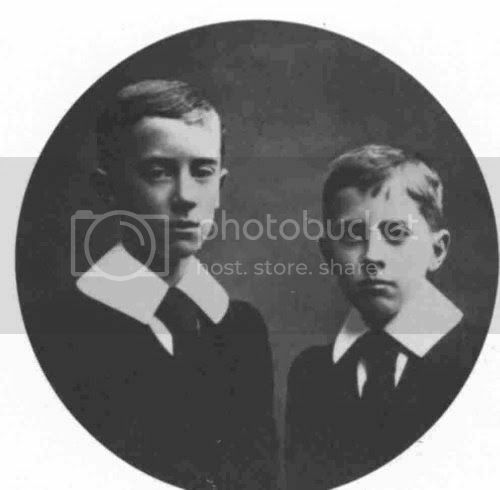 ~ Ronald (no one called him "John", apparently) and Hilary, his younger brother by two years, in 1905, the year after their mother's death. ~ Ronald in 1911, when he and his friends at school started the secret "T.C.B.S. ("Tea Club and Barrovian Society"). ~ Ronald as a new officer, and newly married to Edith Mary Bratt, in 1916 (an "older woman" [by three years] with whom he fell in love at 16, was subsquently forbidden to see, and to whom he sent a letter proposing marriage on the day he became 21 -- they were engaged, marrying three years later). ~ Another snapshot from an internet gallery, undated, but which looks to me as if it were taken a bit earlier, before growing the moustache. ~ Edith Bratt, the woman whom Tolkien loved (sorry, there wasn't a date), and who was his inspiration for the character and tale of Lúthien. Edith Mary Bratt was born in Gloucester. Her mother Frances Bratt, then aged thirty, probably went to Gloucester from her home in Wolverhampton in order to avoid scandal, because the baby was illegitimate. Frances Bratt's family owned a boot and shoe manufacturing business. Edith's mother never married and the father's name was not mentioned on the birth certificate, though France's family knew who he was. Even if Edith knew her father's name she never passed it on to her own children. Edith was brought up in Handsworth by her mother and the mother's cousin Jenny Grove. She was a talented musician and could play the piano very well. After her mother's death she was sent to a girls' boarding school that specialized in music. Having left the school she could have become a professional pianist, however, her guardian was not sure about what to do with her future. So he found her a room at Mrs Faulkner's where she, in fact, could hardly practise piano. But it was in this house that she met Ronald Tolkien (J.R.R.T.) in 1908. 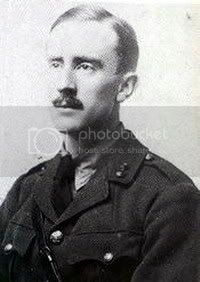 He and his younger brother Hilary Arthur Reuel Tolkien were moved into the same boarding house. 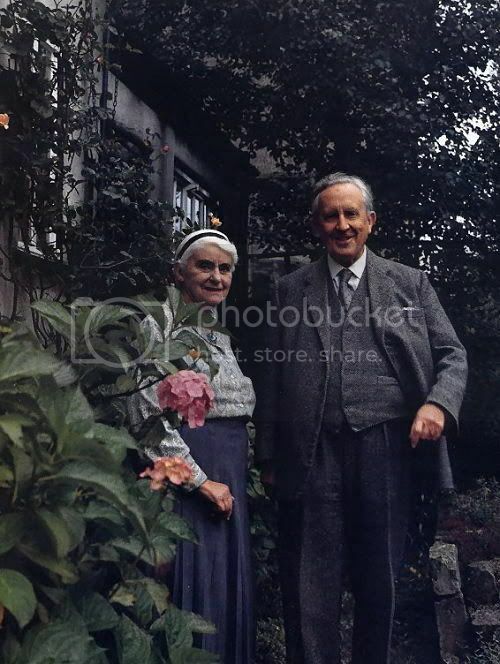 Despite being his senior by three years (she was 19, Tolkien was 16) by the summer of 1909 they had fallen in love. 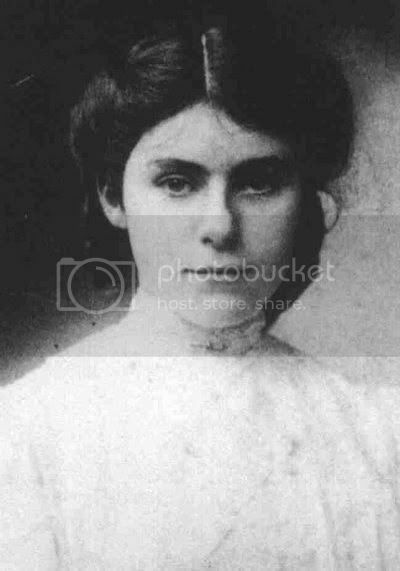 However, before the end of 1909 the relationship became known to Tolkien's guardian, Father Francis Xavier Morgan, who forbade Tolkien to see Edith. Tolkien obeyed this instruction to the letter while Father Morgan's guardianship lasted. 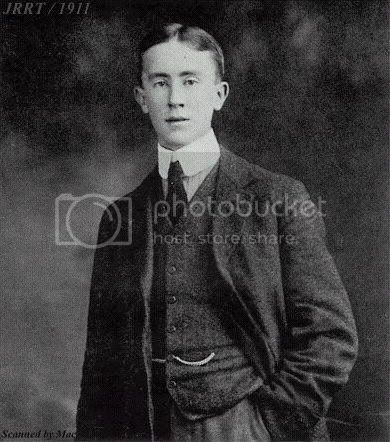 However on the evening of his twenty-first birthday, Tolkien wrote to Edith (who had since moved to Cheltenham a declaration of his love and asked her to marry him. She replied saying that she was already engaged but had become so because she had believed Tolkien had forgotten her. 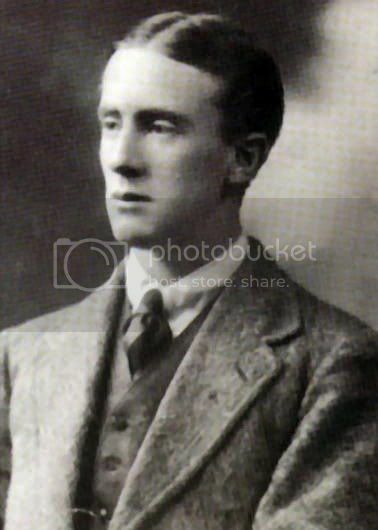 Within a week, Tolkien had journeyed to Cheltenham where the two met up and beneath a railway viaduct renewed their love; Edith returned her ring and chose to marry Tolkien instead. ~ Excerpted from Wikipedia's entry on Tolkien, and the Tolkien Wiki Community's entry on Edith Bratt. 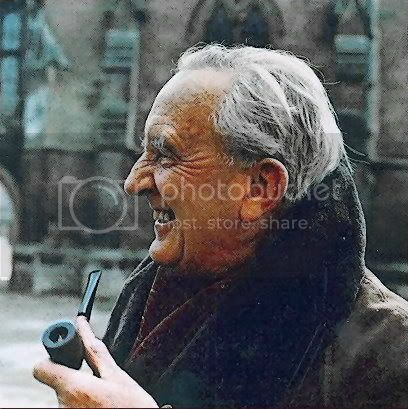 For another good sketch of Tolkien's life, see the bio entry at the Tolkien Society. ~ The first of two family snapshots I found, undated. 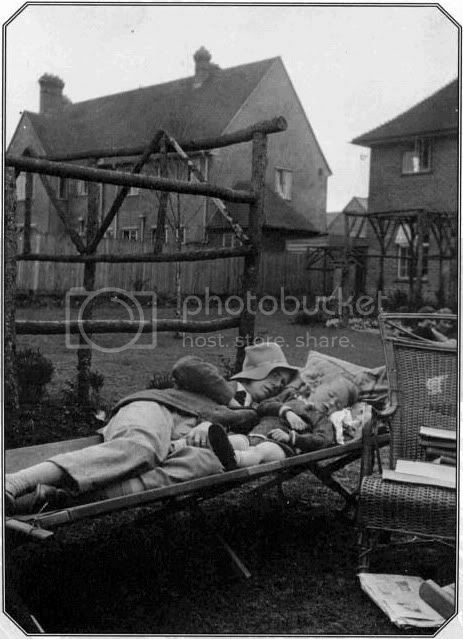 This one shows Ronald asleep with Christopher behind what I assume is their Oxford house. (I'll bet he didn't like this place when they first moved there: newly built, the grounds were nearly treeless!) 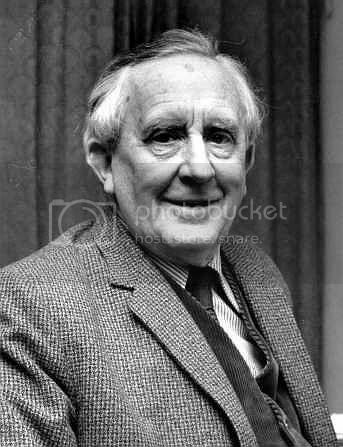 Christopher was born in 1924 and Tolkien was brought to Oxford to be the Rawlinson and Bosworth Professor of Anglo-Saxon in 1925. Christopher, the third of his four children, grew up to be his literary executor, presently still at work on the massive HoME. ~ This photo had no date, either. 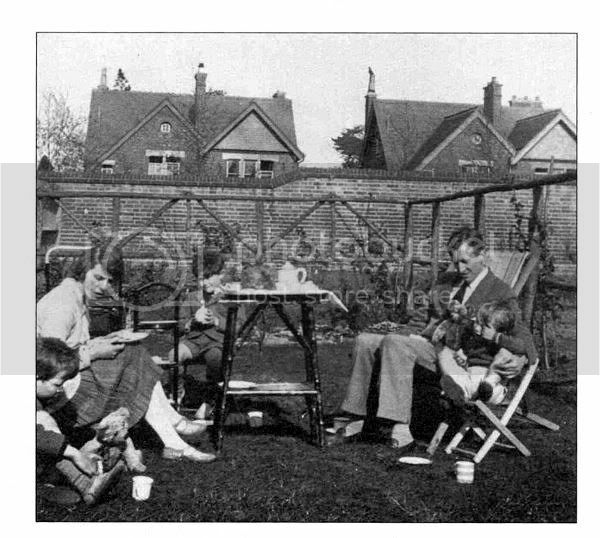 But only three children are shown (Priscilla the youngest was not born until 1929), and Christopher (whom I am assuming is the child with Tolkien) looks about the same age as he does above. Which of the two other boys was which -- John or Michael -- I don't know, but John was older than Michael by nearly three years. ~ A nice photo of Edith and Ronald in their later years. 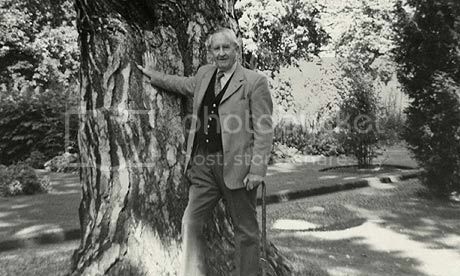 ~ The picture below is the last-known picture taken of J.R.R.T., standing in front of his favourite tree in the botanical gardens in Oxford, Aug. 9, 1973. Not quite a month later, he had died. ~ Edith died November 29, 1971. Tolkien had the name "Lúthien" engraved on the stone at Wolvercote Cemetery, Oxford. 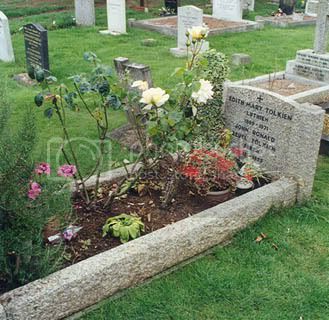 When Tolkien died not quite two years later, he was buried with her, his name and "Beren" added to the stone. 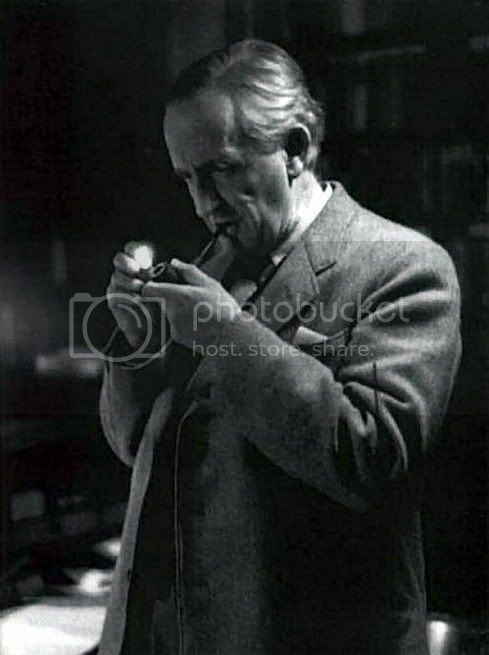 ~ Below are favourite pictures of mine of Tolkien in his "Lord of the Rings" years, that is, when he was an older -- and old -- man. As you will see, he was very fond of "the leaf". ~ I saved my favourite for last. What a good elderly Bilbo living in Rivendell he would have made! whiteling dashed off a charming little manip in honour of the occasion and posted it in a comment box below. With her permission, I am posting it up here. What a good elderly Bilbo living in Rivendell he would have made! I agree! What a lovely tribute, Mechtild. And one of my goals in life is to visit that grave. one of my goals in life is to visit that grave. Me, too, Shirebound. I also badly want to see that mill where he and Hilary used to play, just dripping with Shire-ness, they say. It's a great day to celebrate, ey, Periantari? 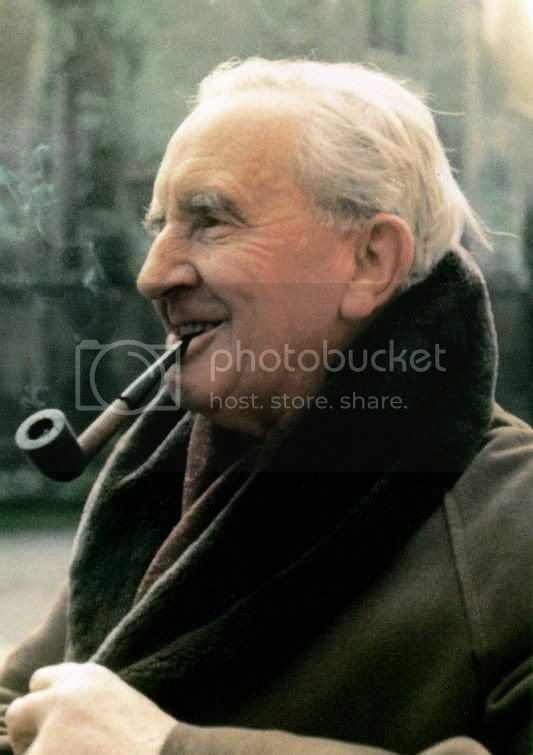 I am so grateful that he shared his gifts--that C. S. Lewis kept after him to finish and publish LotR, and I'g grateful to the Muse that guided him to conceive and create his world in the first place. Thank you, Professor, for sharing your love with us. Your post has both wisdom and beauty. Joy and sorrow, youth and age--"the tale entire"--all play out within his world and life. All those things, along with love. And love and love and love! This was a lovely tribute. I'd never seen most of these photos and they are precious. Edith was such a beauty! No wonder he was smitten with her. Ah, Primula, thanks for bringing your comments here - especially with that icon. How I love images of that scene! Thank you very much for this beautiful short bio and all the lovely pictures! I think the professor makes a wonderful Bilbo Baggins, though he's actually rather Eru Iluvatar. 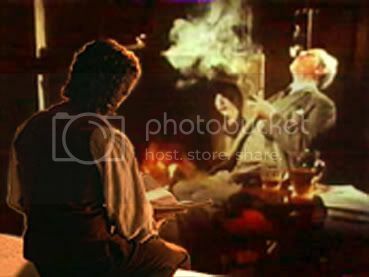 All the same, it's said we should lift our glasses (pots, horns) at 9 pm local time and propose a toast to the professor. So this has still a bit time. 9pm January 3rd has *just* passed here, so I raised my glass to JRRT, that wonderful man. It's a sparkling rosé, which is appropriate for the silly season, and I hope the creator of tra-la-la-lallying elves won't mind. Bless him. "Tra la la, la la la, la la la lally/Tollers his troth did plight in an alley." O.K., under the train tracks (see addition with more material on Edith, not that everyone doesn't know it, but I wanted it in print somewhere in my L.J.). What a wonderful tribute. Which website did you take the pictures from? I only know some of them from the Biography. I especially love the pictures with his family. He must have adored his children - especially when considering that the Letters from Father Christmas and the Hobbit (? not quite sure about that - it's a long time since I have read the Biography) were in fact written for them. I found the family pics quite by accident on Google Images. When I saw the old photo of him and Hilary in 1905, I clicked it open and got this site, which had the family photos. There are a few more I didn't post. Thank you, Majblomma. I just added an excerpt (indented, in smaller type) telling more about Edith's antecedents and their engagement, just so I'd have it printed out in my LJ for future reference. I, too, find it a terribly romanctic story, how they came to start talking to each other from each other's windows at the boarding house and all that. I know that things weren't always smooth-sailing between them, but they seemed committed for the long haul. Thank you for sharing this wonderful tribute to this special man. It's so strange how his words have changed our lives. 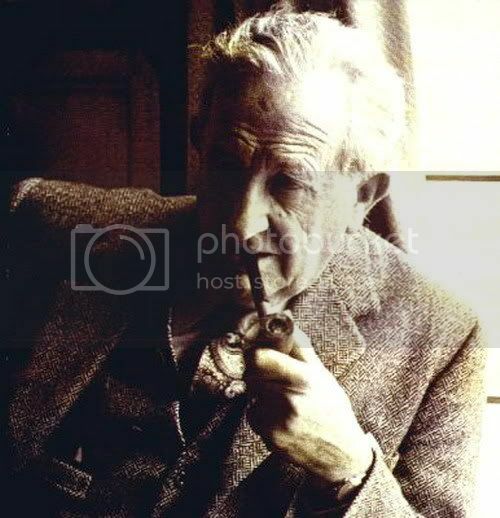 We wouldn't be here writing and commenting if he wasn't for Professor Tolkien, bless him! And yes, he was a perfect hobbit, a true Bilbo Baggins! What a nice tribute to our beloved Professor! Edith was a beauty, and those EYES--intense, smoldering, dark. I would love to visit the Tolkien gravesite and his favorite haunts, someday. I would love to visit the Tolkien gravesite and his favorite haunts, someday. We have only been to the annual Tolkien event held at the Mill once - I think I will remedy that this year. We may also take a trip to Oxford to visit the grave. If you do, Not Alone, please give a little report. By the way, above Brummie (aka Earth's Daughter) also confessed to not paying as much attention to seeing the Tolkien sights as she might. Oh yes, someone else will be in Oxford this year, won't he? How I would love to take him by the hand and say "Come with me, we're going to visit the resting place of someone who transformed both our lives". That would be very cool, really. I'll bet he would find the experience valuable.